A noble band of survivors from the peaceful world of Thundera bravely faces off against vicious mutants intent on destroying them. Make way for exotic creatures, mystical powers and action-packed battles of good versus evil in the exciting saga of the Thundercats! 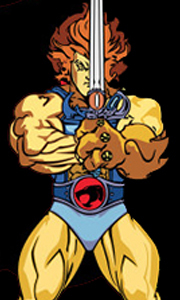 In the first-season adventures from the dynamic animated series, the Thundercats adopt Third Earth as their new home and encounter alien beings galore - some friendly, some lo..
From beyond any unknown galaxy, bringing with them the laws and ideals of their green planet, Thundera, come the Thundercats! Born on a doomed planet in a faraway galaxy, a race of half-human, half feline creatures find a new home on the Third earth. But these fierce feline humanoids must battle both evil mutants and an ancient devil priest who seek the source of the noble Thundercats power. Join the Thundercats as they courageously fac..